World in Motion: Man Drinking Fat. 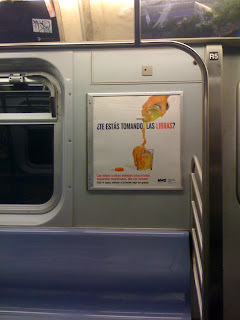 NYC Health Anti-Soda Ad. Are You Pouring on the Pounds? The only thing that looks appealing in that ad is the seltzer bottle at the end, hahah. Now I'm just waiting for them to squeeze out a juicebox... might upset a few parents. Thing is, nutritional habits form at an early age. This is very funny because I actually do visualize fat being poured into a glass. I had a chemistry professor pour three vials of corn syrup into a mug and passed it around. He claimed it was the equivalent of any soft drink on the market. Disgusting yet very effective! I believe visualizing the problem is a great way to break down the psychological barriers or traps we excuse our gluttony with. Hopefully with time, this campaign will cause a slight decrease in obesity.